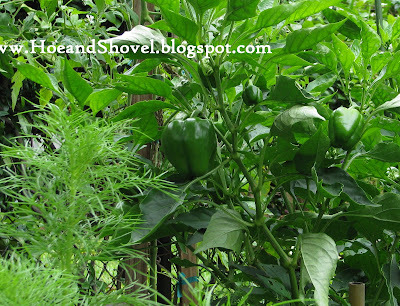 one would take a look at the fastly fading vegetable garden and think it is just a great big green jungle in June. As gardens go a vegetable garden is short-lived. Once the seeds are planted in warm soil they come up very fast and it seems overnight the plants mature and begin to produce their fruit. 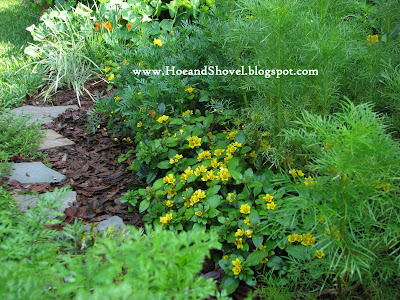 The ground cover of Lysimachia Golden Globes is creeping along nicely across from the carrots and underneath the green bell peppers and the cosmos that are just now budding. The pretty yellow flowers should last all summer. But not the vegetable plants. The foliage on most of them is pretty pathetic looking by this time. Certainly they are, at best, struggling to survive in the heat and humidity and not at all pretty anymore. Even so, the pole beans and green beans are still producing a handful or so a day. The green peppers are still growing like crazy. They must not mind the 90 degree temps we've been having. I'm trying to remind myself why I planted so many of them. It might have been because they DO grow so easily in our climate. Anyone need any bell peppers? 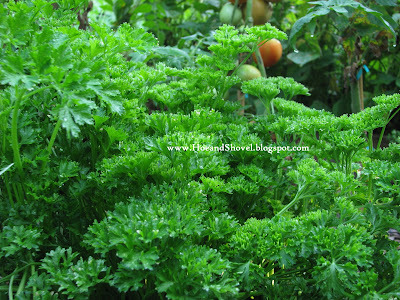 The parsley is very green and very big thriving in the shade of the tomato plants. I keep thinking the swallowtail butterflies are going to find it for a host plant and the caterpillars will have a feast on all the pretty leafiness. Ahhhh, now there's some color I like to see. I'm more than surprised the tomatoes haven't completely bolted. With all the rain we had a few weeks ago and now we have had no rain for over a week and the humidity and temperature have sky rocketed. Do you know how tempted I am to pick these healthy tomatoes before they get fully ripened? Every day I'm watching them... just hoping no worms, or bugs, or birds, or splits or all the gazillion things that can affect tomatoes won't happen before they are ready for harvest. So this afternoon my patience ran out. Just like that. I just couldn't muster up the courage to leave them to fate even one more day. I only plucked three. I left the rest. The more I walk by them, the harder it is to leave them on the vine. They are just so much safer sitting on my kitchen window sill. Don't you agree! 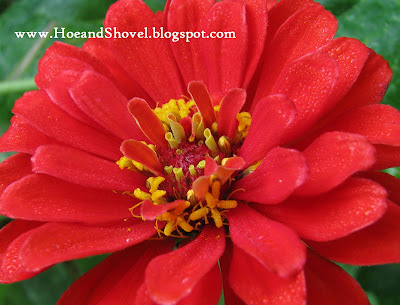 I hope you are all having a great weekend and enjoying your gardens. I've had lots of fun with my grandkids this weekend. Oh boy, I've got lots of catching up to do with you, my dear! And look at that veggie garden! WOW! We still have some things still coming up in the gardens from seed. 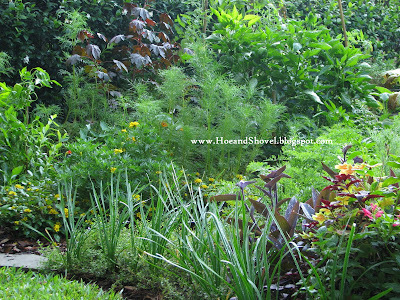 Another month, and my garden will look like that great green lush jungle, too! Love it! Veggie gardens do lose the lushness pretty quickly. Your gardens still look good, we've been eyeballing our tomatoes also. Meems I am still trying to find a suitable spot to start my veggie garden. Wow those tomatoes are lovely and I don't blame you for not tempting fate. That golden globe is it an annual? Meems, your veggie garden looks pretty good to me! I don't suppose I blame you for picking those tomatoes. Ours are the size of large marbles, so we have a ways to go, yet. I'll get the grape tomatoes first, I think. 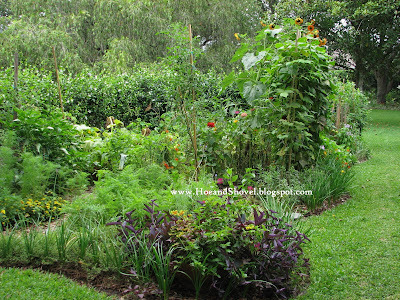 I'd love to have the space you have and be able to plant more ornamentals in with my veggies. I did plant some Lemon and Tangerine Gem marigolds and some orange zinnias in with the veggies, and I want more flowers. Thanks for sharing your lovely garden! And yes, I'd love a few bell peppers. It is that time of year when the green takes over. My garden is doing the same thing. There are a few blooms around but I remember thinking last year I should do something about that. Haven't gotten to it yet. I will jus thave a nice green oasis for awhile. I will take your big green jungle any day. I can't wait to grow veggies! but all the tomato plants are bearing fruit...everyday we count more on them. it is very exciting to check out the daily progress...always something new happening every day. you gotta love companion planting for the very reason you mentioned...getting the blooms long after your veggies are over. we are having such a mild summer so far...we spent all day outdoors...ate out too...and didn't come until way after dark just enjoying being out there. Your garden looks good to me.Our beans are pretty well shot.And we have 2 tomatoes plants left.We've been picking the tomatoes as the bluejays and mocking birds have discovered them.Throw those peppers on the grill! Your parsley is so full and thick...I just have a little plant in a pot on my deck! My 2 tomato plants will give me some fruit, I hope...but if it's like last year, there will be 'splits'! I just hope I'll get a couple to have that yummy homegrown taste and experience! I'd love some peppers (!) but they'd probably be rotted by the time they got to VA! Glad you have time to relax and enjoy your grandchildren. You certainly had a lot of color to share, earlier--I hope you still get to enjoy more of it as the summer continues! Meems, You are just so lucky to have BOTH veggie and flower gardens. To me, that's the BEST of all worlds, even if your veggies don't last as long. I'd love to have one of those 'maters!!!!! Meems, Hello my friend. The in between times are the greenest! It's when I most aware of the drawbacks to shade...well really dry shade! Your vegetable garden still looks like it's producing and it looks like you have the makings for a nice pasta dinner with tomatoes and peppers. Yummy...Cajun food, too! Just add garlic! How about semi green fried tomatoes? I have barely had time to do my own posts much less go around visiting. I keep thinking one of these days I'm going to catch up on all my blog friends. Your veggies are coming up and mine are going down... just shows the vast difference in our zones. I'll be on the lookout for your jungle. Veggies gardens are so beautiful when they are healthy. But so ugly when they decline. Then we start all over again with the fall garden in August/September. I know what you mean. It is important to think it out before going off all willy-nilly just to get it done. You'll want to be close to a water source and make sure it is a place that gives the right amount of sunshine, too. You have SO much space and so much to already do... you need to be sure you're ready for the added work. LOL When would you plant a veggie garden at this point? The golden globe should act like a perennial here. It's my first year with it so I will have to see. Last year I started out much smaller so I couldn't plant many flowers. That's a big reason why I expanded this year. On close inspection (or by clicking the photo) you would see the decline of the plant life -- it is not a pretty sight compared to a month ago. But --- we know that's the way it goes and we look forward to the fall garden where we start fresh again. I guess we can't complain about green... after all it IS one of my favorite colors... and this time of year everything tries to become a jungle. That was a great article. It is hard for our northern gardening friends to imagine losing our tomatoes so early when theirs are just getting going. Reading that article made me feel like my tomato situation isn't so bad after all. 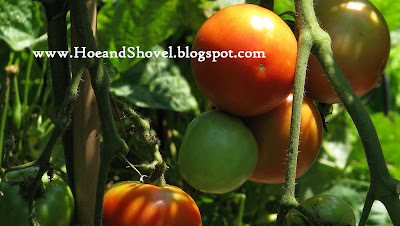 The volunteer plants that came up are loaded with black cherry tomatoes... fabulous for salads. I didn't plant a single one of them this season. You are at the stage we were here back in April. You walk out to the garden and every day there is more to see and it makes you feel like a child in Disney World. So much to see and do and so exciting all at once. Enjoy it... you've worked hard and now you get to see all the results. 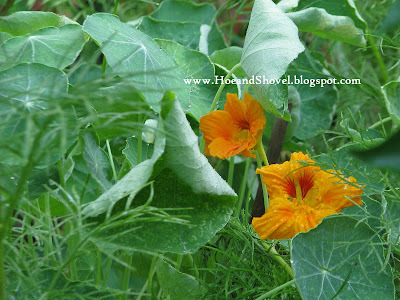 The blooms DO out-live the veggies and also definitely give some consolation to the over heated vegetable plants. Have fun being outdoors... isn't it the best! We've been using the pool at night to enjoy staying outside. Fortunately no birds have yet bothered my tomatoes. I'm not sure why since they are all over the garden. 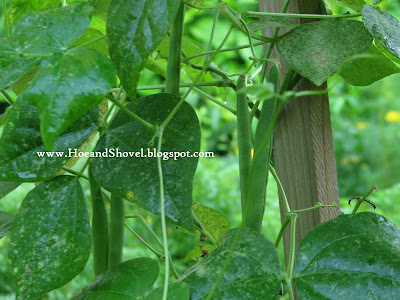 I planted beans in succession so the second planting is still giving me plenty of green beans but the plants look awful. Yes, peppers on the grill have been a delight. The parsley has done really great this spring. I even pulled up one plant and divided it into three. They actually rooted and grew... I just thought I'd give it a try... wasn't sure it could be done. 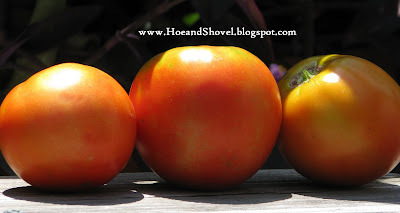 Your tomatoes will be so good you will be hooked on having a couple in pots. It's a good way to grow them so you don't have too many to care for AND you don't forget to water them when they are close by. I sure hope your leg is doing better. Oh, and I wish I could share some with you. They have been so wonderful... lots of tomato sandwiches... I even eat them alone (sliced) just for a snack. Since I don't have much direct sun in the rest of the yard it works out well to have some flowers in the veggie garden that require that extra amount of sunshine. Your veggies look yummy. It looks like you had another successful season.